If you have never graced your palate with the goodness that is chilaquiles, it’s high time to change that. If you have never experienced their glory, let me regale you. 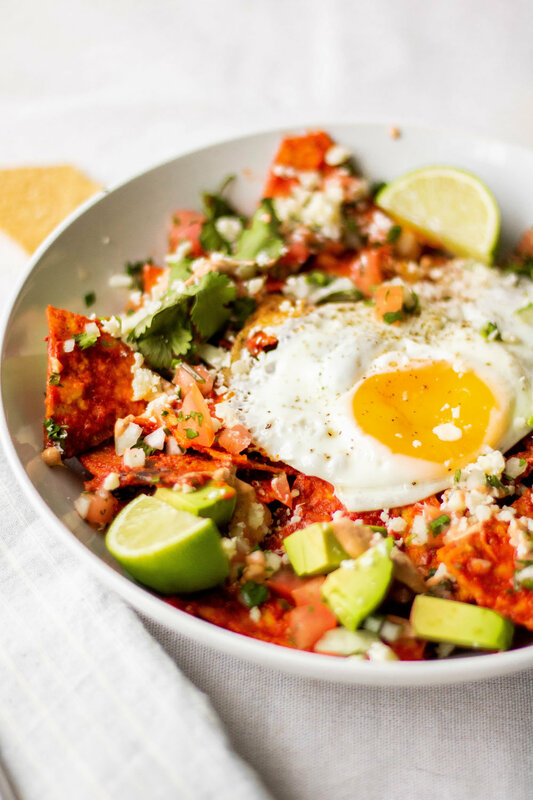 Chilaquiles are basically tortilla chips that have been tossed in a sauce. Sounds basic, I know. Now, they can either be red or green. So either tossed in a salsa verde (green) or a salsa rojo (red). It is 100 percent about the sauce and toppings. Imagine that these are like breakfast nachos that you can top with just about anything. I’ve had them topped with carnitas (amazing), pork belly, carne asada, but I honestly love them just with a fried egg and every topping known to man. When it comes to toppings, for me at least, more is definitely more. I want fresh pico de gallo, avocado, crema, jalapeños, cotija cheese (the Mexican parmesan basically), cilantro, limes, everything. Not only is this just an amazing breakfast, brunch or dinner dish, but it is the hangover food that is a gift from the gods. Nothing soaks up leftover booze quite like some spicy sauce, carbs, and a runny egg. I mean, it’s scientifically proven. Now, you can buy a jar of your favorite salsa verde or even use a store bought enchilada sauce in a pinch, but making your own sauce is 100 percent worth it and extremely easy. Some reconstituted dried chilies, a roasted tomato and some spices and garlic go into a blender and come out a smooth and flavorful sauce. You can even make a double batch and freeze it so you can have chilaquiles any time. This is hands-down my favorite breakfast or brunch food and I know you’ll love it too once you’ve experienced it! To make the guajillo chile sauce: Preheat an oven to 400 degrees F. Place the tomato on a small baking sheet lined with foil or parchment paper. Roast in the oven for about 20-30 minutes until charred in some spots and very soft. While the tomato is roasting, place the dried chilies in a heat proof bowl and cover with boiling water. Allow the chilies to soak so that they are soft. In the carafe of a blender, add the roasted tomato with any juices from the pan, the rehydrated chilies with a little of the soaking water, and the remaining ingredients. Blend until very smooth, adding the chile soaking water as necessary to make a smooth sauce. Set aside until ready to use. To make the chilaquiles: Heat 1 tablespoon of neutral oil over medium heat in a large nonstick skillet. Add the chips and toss them to coat with oil. Add just enough chile sauce to the pan to coat the chips, tossing them so that every chip is coated with sauce. The chips should just be slightly softened but not soggy and should retain just a bit of chewy/crunchiness. Transfer the chilaquiles to serving bowls and top with fried eggs, avocado, pico, cilantro, sliced jalapeños, drizzle with crema, sprinkle with cotija cheese, and serve with lots of limes on the side. You can substitute your favorite jarred sauce in a pinch, but making the sauce is so much better. If you don't have a Mexican market nearby, I love the "restaurant style" tortilla chips from Trader Joe's.